AirTurn contacted me in September for the possibility of reviewing one of their products. I wasn’t familiar with their brand but they had some interesting products, primarily designed for hands-free page turning of notation as you might have already guessed from their name. Browsing their website the BT-200S-4 caught my eye in particular. I immediately started dreaming of ways I could use it with REAPER, particularly for loop recording. I told them which one I wanted and I soon had it in my hands. Disclaimer: AirTurn offered me the BT-200S-4 at no cost for review. I am not being paid to write the review but I did receive the product for free. At the request of AirTurn there are also affiliate links in this article. I hear you can get free shipping with that link as well. The AirTurn BT-200S-4 is a rugged, compact, wireless, programmable 4-button foot controller that can be connected to Mac, pc, android or iOS device for sending keyboard commands or MIDI. I use it with REAPER on a Mac but you can also connect it to an iPad and a virtual amp/pedalboard software for fx pedal bypass. In the box is the pedal and a fullsize USB-A to negative-center barrel connector cable for charging the battery, and yep, it can be powered by most pedal power supplies as well. The pedal itself is not metal, but a good quality plastic. It’s small (but not too small) and lightweight enough that it’s going to be a noticeable burden to travel with. It weighs less than most stomp boxes. The buttons feel good, a soft click similar to my TC pedals, not hard like the buttons on my Joyo or Electro-Harmonix pedals. One of the metal caps on a footswitch came loose. It just needs a drop of glue, I’m not bothered by this but I think it’s worth mentioning. The first roadblock I hit was with bluetooth connection. My main DAW system was an 2011 iMac, which has an older bluetooth chip. Bluetooth adapters for Mac are annoyingly rare and expensive and I came close to ordering one. Good thing I didn’t because a month later, this iMac’s video card finally died. iMac sold for salvage, now I’m using my backup 2015 15” MacBook Pro for my studio, which luckily does have the correct version of Bluetooth. So with the AirTurn, and compatible computer I just needed one more thing, the AirTurn Manager software, which can be found on the App Store (Mac), iOS App Store or Google Play Store (Android) for free. I couldn’t find the windows version of the software if there is one. So I did have quite a bit of trouble with connecting the AirTurn BT-200S-4 to my Mac as a MIDI device, enough that I had to contact their tech support person Tyler to get me through it. Turns out he’s a REAPER user as well. Connecting it normally isn’t so hard, so if you use mode 2-6 you’ll have less trouble. The AirTurn Manager software offers a lot of ways to configure the pedal. I focus on MIDI mode for the rest of the article but I’ll mention there are 6 user-layouts/modes with 2-5 available for various keyboard inputs (spacebar, arrow keys etc) and the last dedicated to MIDI messages. Momentary: When the switch is pressed the On value is sent. When the switch is lifted the Off value is sent, or the output is reset. Pulse: When the switch is pressed, the On value is sent followed immediately by the Off value. Command: When the switch is pressed, the On value is sent. Note that the operating system key repeat will not apply. To me ‘Command’ mode seems most appropriate. As well you can set it to send commands in Sequence or Combination. Sequence will send the Item 1 On message, then any following Item On messages. If there is an Off message associated with the On message of Item 1 it will not be sent until the switch is released and in the Off position, followed by any Item 2-4 Off messages accordingly. Combination will send all Item On messages simultaneously. If there are any Off messages they won’t be sent until the switch is released and in the Off position. If there are multiple Off messages they will be sent simultaneously when the switch is released. I haven’t found a use for that personally but seems like it could be handy. 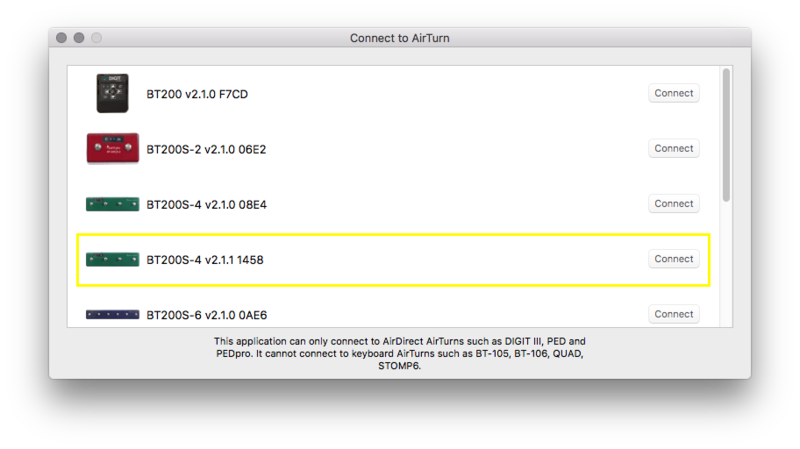 Connecting the AirTurn BT-200S-4 to MacOS in MIDI mode. Press and hold the mode button until red light flashes 7 times, approximately 7 seconds to enter mode 7 (MIDI). (Red and blue lights will flash 7 times to confirm mode 7). Double-click on Bluetooth, a window will pop up. A new MIDI device named BT200S-4 v2.1.1 1458 will be added. 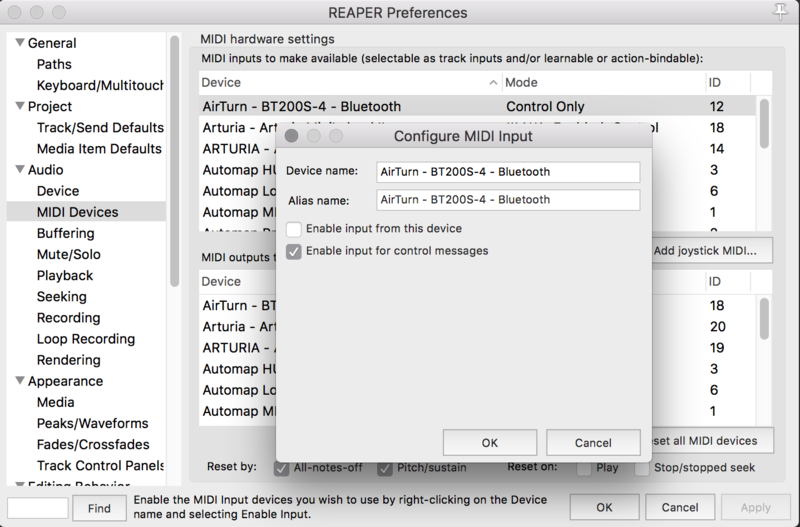 If you check in system preferences/bluetooth you’ll see the BT200 is connected, Airturn Manager will also see it, and if you go into your DAW you’ll be able to add it as a MIDI device (more on that later). So these steps only take about a minute, but it took me a lot of trial and error to get that figured out. 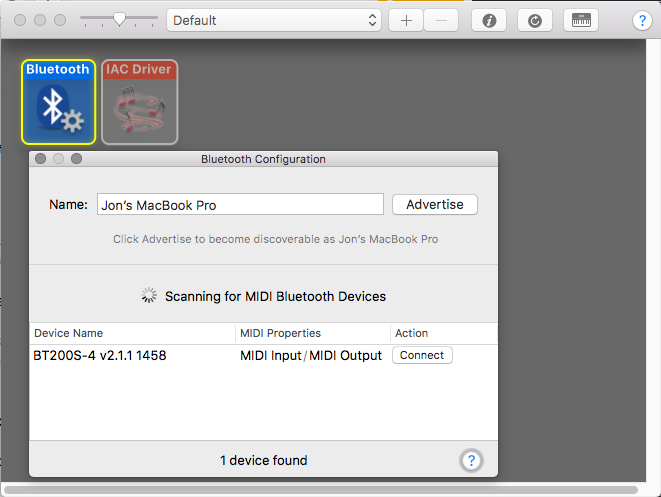 If you try to connect it anywhere other than Audio MIDI Setup first, like adding it in system preferences/bluetooth it will not work as a MIDI controller. Holding the mode button is only necessary to do once, the mode will be remembered by the BT-200S. My main goal with the AirTurn BT-200S-4 is to have it control many functions in REAPER depending on if transport is stopped, playing, or recording. I’m not at that point yet, I’m having trouble setting that up and I don’t think it’s anything to do with the AirTurn. Let’s just get a few basic functions set up – Play/stop, Record, Metronome toggle, Tap Tempo. 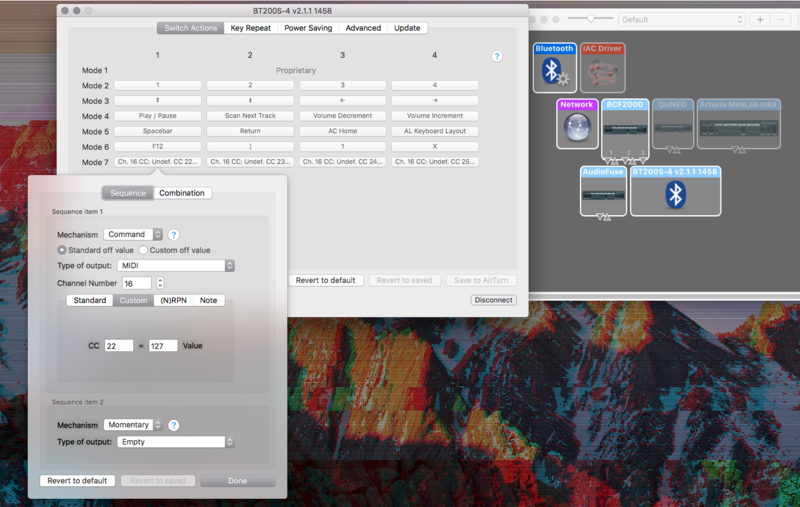 Mode 7 button 1: set mechanism to “Command”, type of output: “MIDI”, pick an MIDI channel, then Custom CC# and value. There are a ton of other options in there but I think most users will be happy with this and shouldn’t interfere with existing MIDI inputs. Simple as that, we can now open REAPER’s action list (actions menu, show action list) and assign any of the BT200S buttons to anything. Pick an action such as “Transport: play/stop”, click add in the bottom left, then press the footswitch. You should see “MIDI Channel 16 CC 22” appear. I also make sure this is on Absolute mode. Do the same for button 2, assign it to “Transport: Record”. This is the most generic example of what you can do with the pedal, but it’s not bad. It’s stuff you often need when your hands are busy with a guitar or keyboard. The AirTurn BT200S-4 works well, after the initial troubleshooting, and I’m sure I’ll get a lot of use out of it. Long battery life, no wires to trip over, what’s not to like? The $99 cost is fair, considering there is nothing else available that offers battery power, wireless, and software to configure. There’s a lot out there that is more expensive, more bulky and too generic or designed for connecting to certain software/hardware. 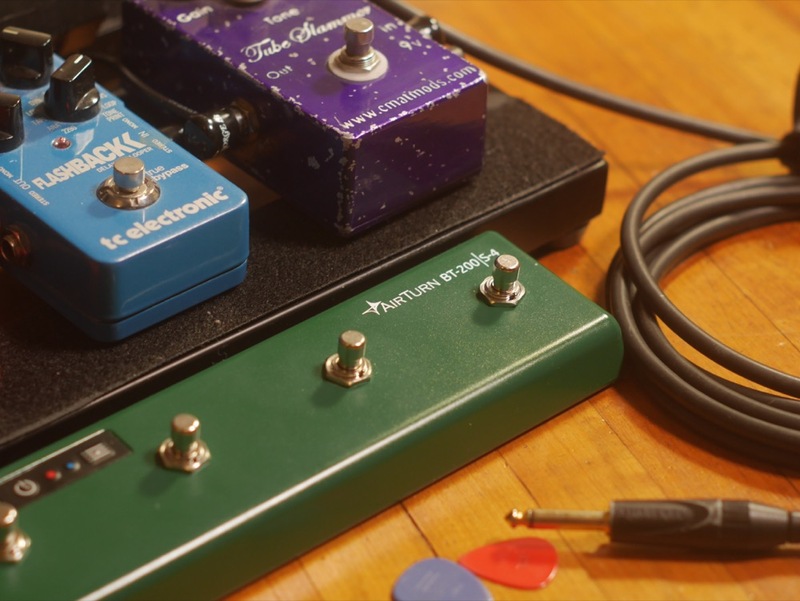 AirTurn has a few other models in a similar style, a 2-button version of the BT200, and the Stomp6, a more rugged 6-button version for guitar players.